Tailoring is making a custom fitted garment, specifically designed for an individual and their particular build. This gives the best possible result for every person. Very few individuals have the ideal / generic build that most off-the-rack clothing is designed to fit. Most individuals benefit from custom suits because these suit accommodate individual differences and compensate for a shorter / taller wider or thinner build. Perhaps everybody should have at least one custom suit for more formal events. Alterations are less extensive changes to a suit or garment. They are usually concerned with how a piece of clothing fits and will alter one, or maybe two aspects of the garment. This can be anything from taking up a hem to bring in a waistline. It would only be a slight exaggeration to say that alterations on an otherwise well-fitting garment is the next best thing to a tailored suit. Occasionally an item of clothing is altered in order to change its appearance rather than its fit. People rarely bother to repair cheaper clothing; often they are content to simply replace items. But good quality clothing, or anything that is hard to replace, is well worth maintaining. If your clothing is damaged through misadventure it can usually be repaired, often without the damage being noticeable. Wedding dresses and Bridesmaid dresses are often bought in for alteration before the big event. Wedding dress alterations are mostly about design changes, where bridesmaid dresses are about getting the right fit for each of the bridesmaids. Though there is some variation either way with this practice. The fabric and structure of a wedding gown is quite different to almost any other type of garment. Decorations on wedding dresses can be elaborate, with frills, beads and other ornamentation; else, they can be simple and elegant, with great dependence on the right fit. The only comparable garments are for fancy dress or elaborate balls. Such dress designs requite a certain amount of skill, expertise and experience. Some individuals do attempt wedding dress modifications themselves. This is fine if you have the necessary skill and if the alteration is minor. Such alterations were common a few generations ago when many wives often made clothes for the whole family. Modern trends towards working families means only a few women and men possess the required sowing skills for such fine work. Wedding dress modifications should be made as early as possible. But often a bride plans to ‘get in shape’ for the big day, so late alterations become necessary. Remember that the veil, shoes, undergarments and anything else worn or carried on the wedding day should be carefully considered with the dress design. Everybody wants the final overall look to be as effective as possible. There are both new ideas in fashion and there are old ideas that keep coming back. In both cases we can find that popular clothing can be altered to suit changing fashions, or to accommodate personal preference. Else, we might just need to accommodate our own physical changes as we age. If you have hand-me-downs clothes that have been stored for a while you might well find that there are a few good items that are worth wearing, perhaps with a few alterations. If the items suffer a little odour after being stored you might try: washing them with borax; storing them with baking soda; leaving them inside out in the Sun for a few days. A few alterations and clothing can fir us well and reflect who we wish to be. 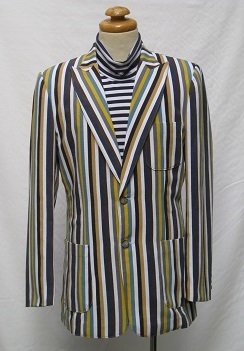 A new addition to our catalogue are Ivy League Style Jackets in a variety of colour palettes. These Jackets are perfect for an afternoon outdoors and they’re just as suave for an art gallery opening. For a limited time they’re are available for $360.